The Neel Dongre Awards/Grants for Excellence in Photography was established in January, 2012. Neel Dongre (1944-2009) was one of the most successful entrepreneurs in the country who took a keen interest in mentoring young people, encouraged them to dream, and helped them fulfil their ambitions. The grants are aimed at recognizing young, emerging and active photo practitioners who demonstrate talent and the passion to communicate with visuals. The awards are offered to serious practitioners as recognition for exemplary work in their genre. A corpus fund of Rs. 50 Lakhs was created, with support from Mrs. Urmila Dongre. The awards/grants have seen five successful years, with over 30 recipients, many of whom being emerging photographers then, are now doing exemplary work in the field of documentary photography and photojournalism. This year we are honored to announce Zeiss as the lead supporter of Neel Dongre Awards/Grants for Excellence in Photography 2017-18. Our other supporting partners include - Pixpa: our Professional Website Partner; and Mojarto: our Online Art Partner. "Neel Dongre Awards/Grants conceptualized and curated by Aditya Arya and PArthiv Shah is a huge leg up for the growth of the next generation of photographers to emerge from India. The rigorous selection process, the subsequent mentorship provided to young photographers is a much needed service in the process of developing a strong language. Photography an immediate communication is often devalued by practitioners themselves . The deep thought behind the award is bringing in a conceptual framework which is being enriched through theory, practice and a strong accent on the many alternate forms of printmaking. The award encompasses the artistry of photography where the document, the photograph and the art of making are in perfect harmony and balance. A remarkable achievement"
Managing Committee: The awards are administered by a Managing Committee consisting of Mrs. Urmilla Dongre, Parthiv Shah, Aditya Arya (Trustee), Premola Ghose, Asha Rani Mathur and artists and designers invited to be on the committee for a period of two years. Cramped narrow lanes leading to up-market restaurants, Mom n Pop shops next to high end boutiques, urban street art overlooking old architecture, and close quartered buildings brimming with migrant population; In short, a motley of metamorphosis. Sounds familiar? These are the Urban Villages of India– The peculiar outcome of a swiftly evolving urban environment, with the lingering remnants of rustic or historical origins. ‘A mosaic of sub cultures’, as architect Christopher Alexander described them, these urban villagers are an abode of parallel lives evolving more rapidly than one can fathom the very existence of its portraits of contrast. In a land as multifarious as India, as divergent as these urban villages may be within their own confines, they also differ from from colony to colony, city to city. On one hand, for example, there’s Hauz Khas Village and Khirkee Extension of Delhi, that were defined as ‘Lal Dora’ regions in the 1900s as village lands to be used for habitation purposes only, legally outside the purview of local municipalities. A century later, these ‘non agricultural’ lands have transformed into one of the fastest emerging entertainment and art hubs. On the other hand there’s Mumbai’s Chuim or Pali that have still managed to retain some of the old world charm while being engulfed in the urban frenzy of a typical metropolitan city. These melting pots of cultures have blurred the boundaries of the definitions of ‘urban’ and ‘rural’ through an anomalous amalgamation of its social networks, commercial utility and the constantly evolving architecture. The rate at which this transformation has happened, one might wonder what their future has in hold. This macrocosm is mini India within the developed cities, where people live, work, produce, celebrate. 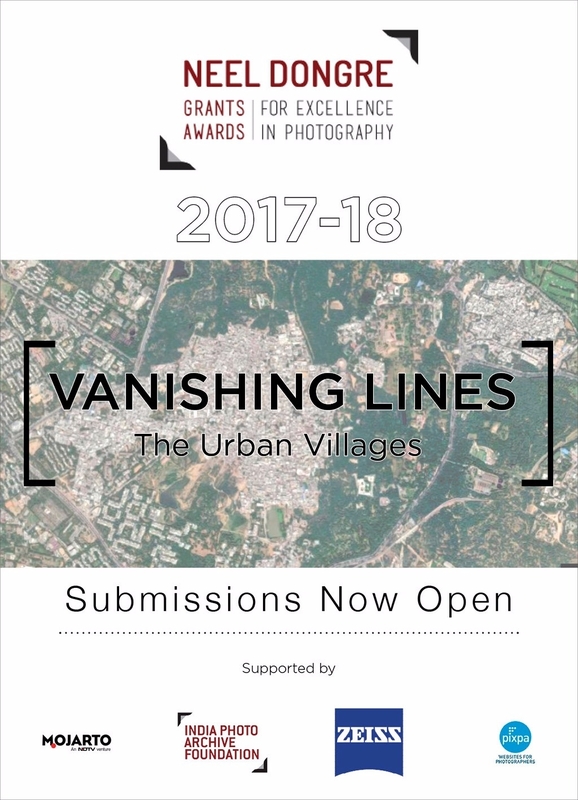 We invite submissions for ‘Vanishing Lines – The Urban Villages’ from interested participants on their perspective of urban villages that have caught their attention. The theme is open to the visual interpretation of any aspect of these urban villages that is defining, meaningful and significant in the context of not only the history and anthropology but also the evolution of our rapidly changing cities in the face of urbanization. We would like the photo grant/award recipients to take a visual journey for the next seven months in the narrow streetscapes of these urban villages that have grown organically. Inviting practitioners across India to apply for the Neel Dongre Award for Excellence in Photography 2017-18. The award shall be offered to one individual who has shown consistent and exemplary work in his/her genre. The applicants are required to submit a written proposal for their project based on the announced theme. They also have to submit a brief note on an ongoing/finished body of work in any genre of photography; Social Documentary, Photojournalism etc, accompanied by images that visually demonstrate their skill and understanding of the project. - The awardee will be given Rs. 1,00,000 to produce a body of work on the announced theme. - The award/grant will finally culminate into a collaborative exhibition for a period of two weeks and the printing of a catalogue that carries the body of work of the awardee and grantees. - The awardee will have the opportunity to work on their project using world class *Zeiss lenses and have their work showcased on the Zeiss global website. - The awardee will also get a one year free subscription to creating their own website through *Pixpa and will also be periodically featured as an artist on *Mojarto. Eligibility: Professional practitioners (Indian Nationals only) with minimum 10 years of experience above the age of 35 (as of 1st June 2017). The individual chosen, will have to produce any or more than one of the following proofs, to be ascertained as a professional photographer: Proof of any membership with a professional body, Published work on a consistent basis, Assignment Billing. *Zeiss reserves the right to use images from the produced body of work for their international and national communications, with due credit to the photographer. The grants are presented annually to photographers in the early stages of their careers who have a keen interest and the inclination to take it further at a more serious level. The objective of the grant is to identify individuals with an eye for visual storytelling, and to mentor them and provide a visible platform to showcase their work with the hope of transforming them into more confident and motivated visual artists. - Each year, a group of individuals are selected, given financial assistance and are mentored to create a serious body of work based on the theme announced for that particular year. - The financial assistance to each recipient will be rewarded in the form of Rs. 25,000-Rs. 50,000 (as decided by the managing committee), given in phases based on timely submissions during the 6-8 month period they will get to work on the theme. - They will be mentored constantly throughout this time period by the Jury and Curator. - The grant finally culminates into an exhibition for a period of two weeks and the printing of a catalog that carries the body of work of each recipient. - The grantees may get the opportunity to work on their project using world class *Zeiss Lenses. Recipients who get to shoot on Zeiss lenses will also have their work showcased on the Zeiss global website. - The grantees will also get a one year free subscription for creating their own website through *Pixpa and will also get a chance to be featured periodically as an artist on *Mojarto. Eligibility: Submissions for the grant are open to all Indian Nationals above 18 years of age. Please have a look at the eligibility criteria for the award/grants as mentioned above before submission. -	To be submitted as an attachment in the email. - A note on the body of work submitted. Word Limit: 200 words. Submissions that do not abide by the above rules will not be considered. - Awards/Grants are strictly for a body of work and not for individual images/photographs. - Photographer must hold the copyright and all required legal rights to submit, publish and exhibit the same. - The managing committee reserves the right to choose from the submissions or invite submissions for the Awards/Grants. - The grant/award recipients have to ensure timely submissions and review of the project in phases. - The decision of the managing committee is irrevocable and final in all matters pertaining to the awards/grants. - The Submissions will not be returned so please do not send original material. -	Financial assistance to execute the proposed project over a period of 6-7 months. -	Each grantee is offered mentorship and guidance by the Curator and Jury throughout the course of the 6-7 month period to create a meaningful body of work. -	The recipients are given a visible public platform to showcase their work in the form of an exhibition, previously held at India International Centre, for a period of two weeks. -	Catalogs are printed each year showcasing the work of each photographer. The printing of the catalogs is paid for by India Photo Archive Foundation. -	The prints for the above-mentioned exhibits are paid for by India Photo Archive Foundation. Recipients are also offered a 50% discount on the final prints of the exhibited works for their personal use. - The recipients get an option to document their respective projects through world class Zeiss lenses, which in turn allows them the opportunity for their work to be showcased on the Zeiss global website. - All the recipients get a free one year subscription to create their own website on *Pixpa, and also the opportunity to periodically get featured on *Mojarto. -	The exhibition showcase comes with a fair amount of media exposure and interaction with the press which results in the works being featured in various online and print platforms. In an age when digital information is all around, it’s easy to forget that great volumes of historical images of India— journalistic, political, personal, developmental and social—languish in neglect in institutions and homes. These photographic archives form an essential part of our cultural heritage and The India Photo Archive Foundation has been established with a view to identify, preserve and document such photographic legacies, highlighting the historical value of photographic archives and collections and to encourage their dissemination, access and use for academic, institutional and cultural purposes. The Foundation also aims at encouraging a visual dialogue in the field of photography through various initiatives and to aid the development of a platform for amateur and professional photographers, over the ages. With the coming of the digital age, we have witnessed the rise of a visual culture where photography as a profession and art has evolved giving rise to a plethora of genres, attracting talented minds. However, many of these budding visual artists go unnoticed due to the lack of support in the form of institutes with adequate equipment, funds, scholarships, and relevant platforms to display and publish their work. The Neel Dongre Awards/Grants for Excellence in Photography is an initiative aimed at bridging this gap.